Apple Thunderbolt 2 4K Displays will Come with 27" and 32"
Thanks to a Redittor, the news goes around that we might be seeing Thunderbolt with Retina soonest. Last month when Apple unveiled its new Mac Pro with the capability of supporting 4k displays simultaneously, many fans went disappointed considering that no new higher resolution displays were announced to get the most of this Pro. With the announcement of new Mac Pro, launching of new Thunderbolt display became inevitable. Thunderbolt Display was launched in 2011 and hasn’t received any upgrades. 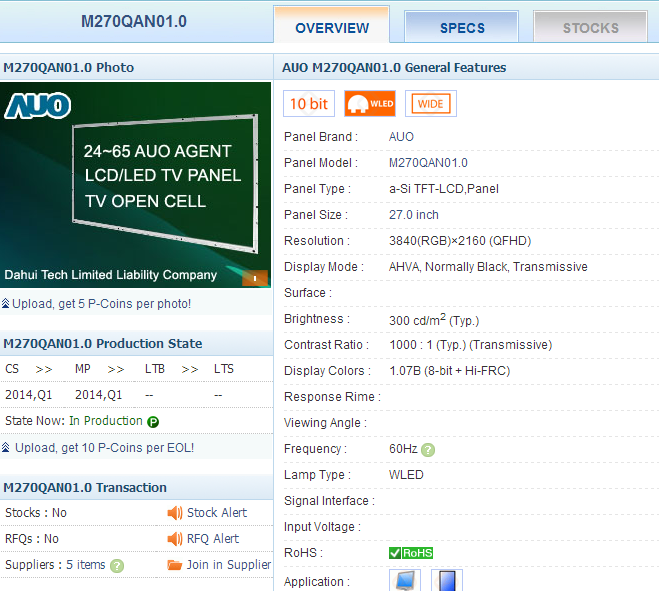 The said Redittor spotted that AUO, previous manufacturer of iPan Mini displays, is now manufacturing 27inch and 32inch 4k displays. These displays use DisplayPort signalling which Apple LCD displays use and are fully compatible with Thunderbolt without any additional signal processing. Although unconfirmed, it is very likely to soon see Thunderbolt 2 with these display panels being manufactured by AUO. It is also being discussed if Apple would consider using 16:9 ratio 3840 x 2160 panels for a 4k display as previously it has been suggested that Thunderbolt 2 might be pushed wider to 4096 x 2160 Cinema 4k standard. Although expected, there are no timelines and Panelook’s in production shows it might be a good few months until we see something in the form of an official announcement.